So it was always a real treat if my mom surprised me with my favorite: Yoplait's lemon-flavored yogurt. My love for lemon yogurt hasn't changed, though my standards for food are now much higher. Flavored yogurt cups are still a frivolous expense — especially the organic ones! Boy, are those expensive and still full of sugar! Rather than spending money on overpriced, flavored yogurt cups that are full of less-than-desirable ingredients (Did you know Yoplait yogurt cups contain artificial sweeteners, flavors, AND colors?? ), I've recreated that slightly sweet, bright lemon-y tang by adding just 3 ingredients! And my version contains no added sugar, thanks to the addition of my favorite low-glycemic, low-carb sweetener: liquid stevia! Rather than spending money on overpriced, less-than-nutritious, flavored yogurt cups, I've recreated that slightly sweet, bright lemon-y tang by adding a bit of fresh lemon juice and lemon essential oil. And my version contains no added sugar! If I do say so myself, my lemon essential oil yogurt is even BETTER than any flavored yogurt cup in the store. Makes 2 servings. Combine the yogurt, lemon juice, lemon essential oil, and stevia in a bowl. Stir or whisk until combined. Taste and adjust the flavors to your liking -- adding a bit more stevia or another drop of lemon essential oil, if desired. Divide between 2 bowls -- 3/4 cup each. 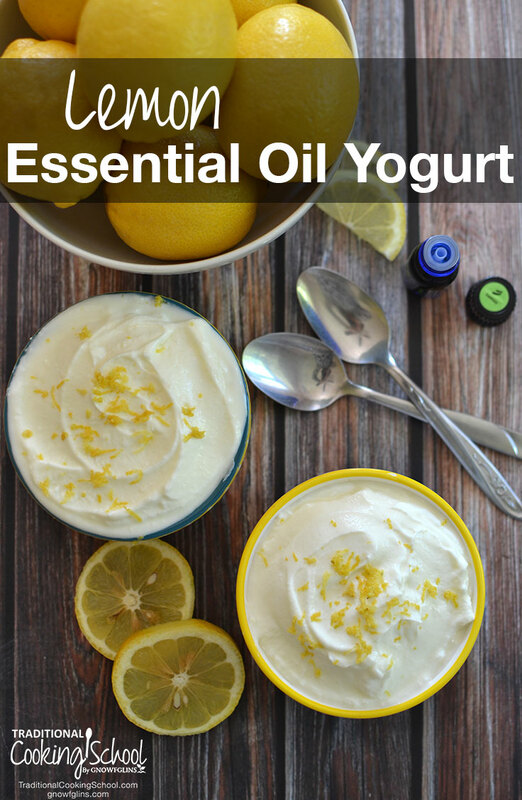 Lemon Essential Oil Yogurt: Why Use Essential Oils? The pure, concentrated lemon essential oil lends a bright and fresh lemon flavor to foods, unlike lemon extract, which can often taste bitter or too sweet. Lemon juice does give the yogurt a lovely flavor. When adding more liquid to yogurt, however, it can make it runny — especially if you're using homemade yogurt that hasn't been thickened with gelatin. So lemon essential oil is the perfect solution: bright lemon flavor, no runny yogurt! And if you're looking for even more ways to save money with homemade flavored yogurt, give these 10 flavor ideas a try! Have you ever used essential oils to make homemade flavored yogurt? 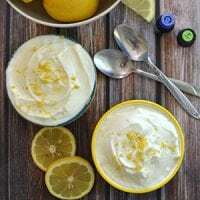 Do you want to try this lemon essential oil yogurt? This post was featured in 27 Recipes With Essential Oils and 47 Trim Healthy Mama E Meals & Snacks With Traditional Foods. I don’t like stevia, so used just a bit of maple syrup. Served up with fresh raspberries. Delicious! So glad you liked it, Cynthia! I don’t like it that when you add essential oils to a recipe you are ingesting oils. No worries. Just make sure you use “food grade” essential oils. These oils do not harm you. In fact, many have positive results on your health! Enjoy!